Posted in dslr video. 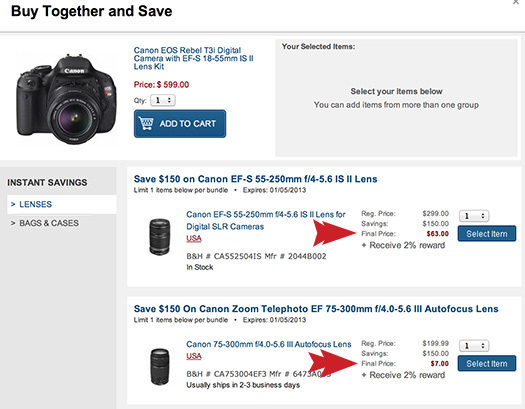 Tags: canon t3i, Lens Bundle, Sandisk on November 26, 2012 by Emm. To keep maybe... but to sell nah. @Baby - That is so true. Keep us posted on how that blend works out. @pops depends what you're doing with it to determine if it'll be a doorstop or not. I'm going to blend and eat mine in 7 years. @Emm - its sad what I'm willing to do for a few bucks here and there. Lol Thanks for the response and posting the deal. It's definitely not something I was looking for nor would have found. What is the saying... Don't hate the player hate the game or something like that. @Pops - I think you can sell them off in pieces and still come out on top. It's just a bit of work though. Ps.. I already ordered it for that reason.. So... Looking for some confirmation my head is in the right place I guess. Any money to be made with flipping this deal? I’m not a canon shooter but… Seems like a potential flip opportunity. QVC has a 2-lens kit available for a 5 easy pay, if you can't afford it all up front + free shipping. Tempted! @Dan Gunman - This deal is offered specifically for today, and I just added both lenses to my cart and total was as listed. You are not limited to 1 lens in today's deal.